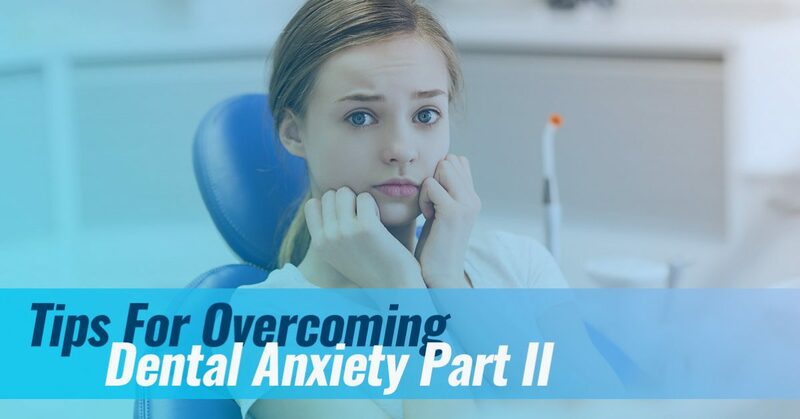 In Part I of our series on dental anxiety, we gave an overview of dental anxiety, its root causes, and steps dentists can take to reduce dental anxiety in patients. To put dental anxiety into context, Peter Milgrom, the director of the Dental Fears Research Clinic at the nearby University of Washington, estimates that 5 to 8 percent of Americans avoid the dentist completely out of fear. A salient 20 percent of the individuals put off routine dental appointments and instead only schedule absolutely necessary dental work. Odontophobia (the fear of the dentist), as these statistics suggest, is a real problem that a significant number of individuals deal with regularly. If you or a loved one has paralyzing odontophobia, there are luckily a few strategies that can help you to overcome the fear. As we mentioned in our first part of the series, odontophobia is rooted in very real reasons. It’s important to understand where odontophobia is coming from to be able to tackle it from the source. In addition to finding a general dentist in Seattle who knows how to treat patients with odontophobia, there are a few steps that individuals can take as well. We tend to compound and ruminate on our fears when we keep them trapped in our own psyche. Even if you sound like a broken record or you don’t want to belabor someone with your own anxiety, it really helps to voice your fears aloud. You can talk to a supportive partner, a parent, or even a close coworker about your dental anxiety. We also recommend you speak with your dentist and dental office staff. Chances are these trained professionals will listen to you and offer guidance. You don’t need to be a yoga guru or an underwater magician to practice breathwork. If you’re unfamiliar with breathwork, you can do a simple Google search of, “breathing for relaxation” or “breathing to reduce anxiety,” and you’ll find a plethora of guided videos and meditations. Meditation apps, such as Headspace, also have specific guided meditations directed toward fear, anxiety, fear of medical appointments, and other relevant scenarios. If you’re a more visual learner, you can find alternate nostril breathing tutorials online. As dentists, we think avoiding high-sugar meals is always a good rule of thumb. It’s incredibly important to avoid sugary food before your dental appointments. That’s because sugar will lead to blood pressure spikes, catalyzing the body’s anxiety response. For at least a meal or two before your dental appointment, try to eat protein-dense meals that take your body longer to digest. We tend to see the best results when patients with odontophobia schedule appointments first thing in the morning. This way, there’s less time to sit and dread the appointment throughout the day. You know yourself best, though, so just be sure to schedule a dental appointment time that will minimize your anxiety leading up to it. As a Seattle dentist office, First Hill Dental Center offers general, preventative, emergency dentistry, and more dental services. If you have avoided the dentist or generally dread dental appointments, our compassionate and knowledgeable team can support you. Contact First Hill Dental Center in Seattle today to schedule an appointment today!